More Powerful Engines to take on the Toughest Projects: More power means better performance. To make your job easier, we've given both of our world-renowned E-TVCS diesel engines an extra 1 HP. The L2800 gear-drive model puts out an impressive 25 PTO horsepower (HST model: 23.5 PTO horsepower), while the L3400 gear-drive model provides a vigorous 30 PTO horsepower (HST model: 28.5 PTO horsepower). These clean-running engines are compliant with the EPA's Interim Tier 4 emissions standards. Gear-Drive Transmission (Gear Model): Powerful and versatile means getting the job done faster. You'll finish the big jobs easily with a mechanical shuttle transmission. For easier front-loader operation, the mechanical shuttle shift has a forward/reverse in the low and reverse ranges. Moreover, the transmission offers 8 forward and 4 reverse speeds (8F/4R), enabling you to select the perfect speed for higher productivity. Live Continuous-running PTO (Transmission-driven PTO on L2800 Gear-drive Model): The L2800/L3400 HST models and the L3400 gear-drive model include a live, continuous-running rear PTO for easier operation. The HST models also feature an over-running clutch on the PTO shaft to protect the transmission. Finally, a stationary PTO has been included to enable the use of various implements, such as pumps. Full-open Hood and Slide-out Grill: Whether simple maintenance or a more involved repair, a one-piece, full-opening hood exposes most engine components, making it easier to do either. Removing the front grill is fast, too. Simply slide it out. Large Fuel Tank: An ample 9-gallon fuel tank lets you fill up with more fuel so you can operate longer. Spacious Operator's Deck: To provide maximum comfort, the L2800 and L3400 feature a spacious operator platform. Its semi-flat design also makes getting on an off the tractors easier. Bevel Gear Front Axle (4WD model): A superior feature that delivers an extremely tight turning radius with full power transfer to the wheels at every steering angle. Smooth Power Steering: To reduce fatigue, both 2-wheel drive and 4-wheel drive models come equipped with smooth, easy-turn, integral power steering. Choice of Tires: Tires designed especially for specific jobs enable the L2800, L3400 and L4400 to perform even better. Select from AG, Industrial, and Turf. 3-point Hitch: The large capacity hydraulic pump and cylinder provide powerful lifting capacity, allowing you to use a wider range of implements. Wet-disc Brakes: Responsive and smooth, our long-life wet-disc brakes are immersed in oil, and require only the slightest foot pressure to activate. Roll-Over Protective Structure (ROPS): For maximum protection, all models come with ROPS as standard features. A foldable ROPS is standard on the L4400 and optional on the L2800/L3400. Cup/Mug Holder: This convenient holder securely fits a cup or a mug so you can always quench your thirst. Easy Loader Operation with Joystick Control: A single-lever joystick provides easier operation. A regenerative dump circuit allows for fast bucket dumping, and the series circuit provides for simultaneous operation of the boom and bucket. The valve stays with the tractor when the loader is detached, so that the valve can be used for other implement operations. 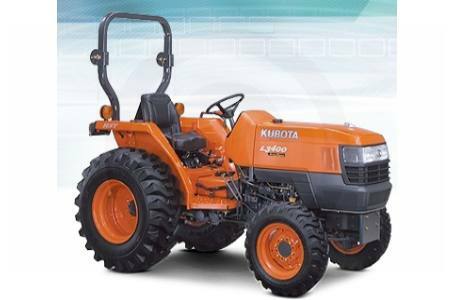 Quick Attaching/Detaching: Thanks to Kubota's innovative attaching/detaching system, you can attach and detach mounting pins and hose couplers from the driver's seat, quickly and easily. As a result, you can move from job to job with greater efficiency. Boom-mounted loader stands make access easy and allow the loader to stand alone when detached. Quick-attach convenience combined with full-mount sub frame ensures sturdiness. Transport lock for safe transporting. Two-lever control for smooth and fast operation. One lever controls boom extension and retraction as well as swing arc. The second lever operates the dipper stick extension, retraction, and bucket curl. Hydraulically actuated stabilizers provide good stability. Backhoe applications require installation of the appropriate loader for tractor stability.